In vSphere 6.5 the command line interface esxcli has a new namespaces and 93 new commands. Esxcli is a complete set of commands that you can use for troubleshooting, configuration or kickstart files. I have created and printed a mindmap to navigate through the namespaces more quickly. This post covers only basic namespaces, available on all ESXi 6.5 hosts. If you've installed additional software you might see more namespaces. 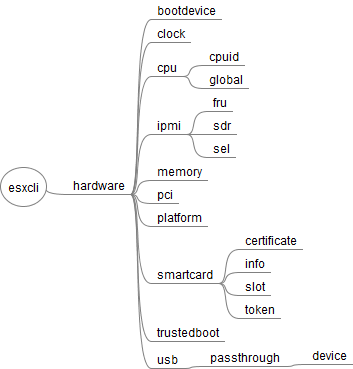 I've also created mindmaps for ESXi 5, ESXi 5.5 and ESXi 6.0.
esxcli - Commands that operate on the esxcli system itself allowing users to get additional information. 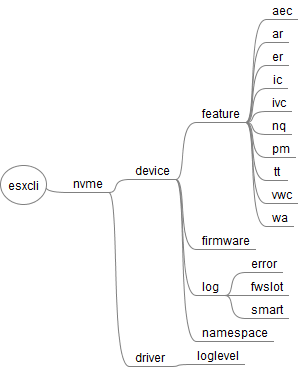 fcoe - VMware FCOE commands. graphics - VMware graphics commands. hardware - VMKernel hardware properties and commands for configuring hardware. 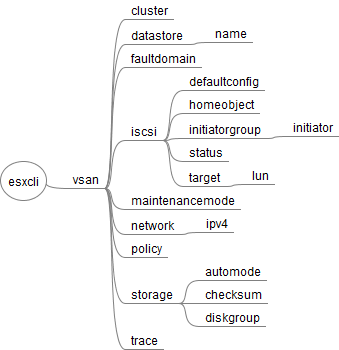 iscsi - VMware iSCSI commands. network - Operations that pertain to the maintenance of networking on an ESX host. This includes a wide variety of commands to manipulate virtual networking components (vswitch, portgroup, etc) as well as local host IP, DNS and general host networking settings. rdma - Operations that pertain to remote direct memory access (RDMA) protocol stack on an ESX host. sched - VMKernel system properties and commands for configuring scheduling related functionality. storage - VMware storage commands. system - VMKernel system properties and commands for configuring properties of the kernel core system and related system services. vm - A small number of operations that allow a user to Control Virtual Machine operations. The device namespace decrypts hardware information from device aliases (vmnic/vmhba). Configuration and information about the Emulex OneConnect Converged Network Adapter. The esxcli namespace can be used to list all available namespaces and commands. 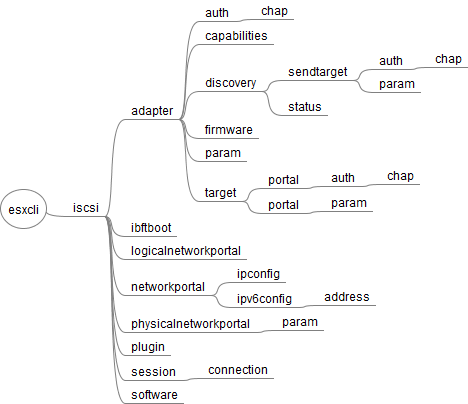 I've used this command to get the list, export it to a CSV file to create this mindmaps. The fcoe namespace has Fibre Channel over Ethernet discovery and adapter listing capabilities. The graphics adapter manages hardware-accelerated 3D graphics for virtual machines. The hardware namespace can be used to gather information about the physical hardware. The iscsi namespace can be used to configure iscsi adapters. This can be really helpful in kickstart scripts, to configure shared storage arrays. The network namespace is the most powerful namespace. You can configure local vSwitches and Distributed Virtual Switches (dvSwitch). You can also manage the local IP address and firewall configuration. This is a must have in your automated ESXi installation workflow. VMware NVMe driver extensions. Allows to view status information from the latest generation of flash drives. Provides information and statistics about Remote Direct Memory Access (RDMA). This sched namespace manages VMKernel scheduling functions. The software namespace can be used to install updates and additional packages. It also allows you to set the software acceptance level to use vib packages created by the community. The storage namespace has a lot of use cases. You can configure lun masking, mount nfs shares, manage vmfs filesystems and investigate the path configuration. Any ESXi host related configuration tasks can be performed with the system namespace. The vm namespace is useful during troubleshooting. It can be used to forcibly kill virtual machines that are stuck and not responding to normal stop operations. The vsan namespace manages the Virtual SAN feature, introduced with vSphere 5.5. 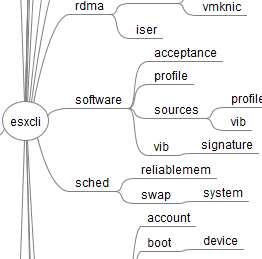 This is a complete mindmap of all esxcli commands. It's quite large, but if you print it to A4 or letter, you can still read it.